Established in the Year 1949. We have made a name in the Sports Industry as one of the reliable, affordable supplier of Sports equipment. We have been conferred the ISO 9001:2000 quality certification. Our business module is to supply better value at low prices. We are proud of the journey we have taken to reach where we are today. 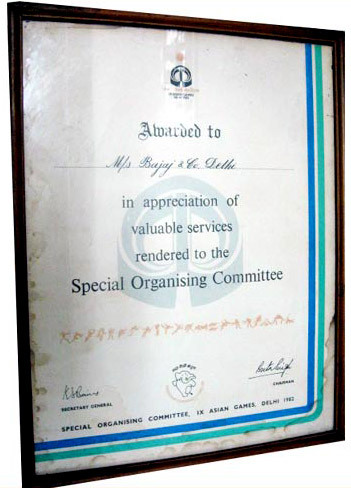 The tremendous hard work of our mentor, Late Shri B.N.Bajaj who had a passion to exceed customer satisfaction & making a positive difference has laid the foundation of delivering value to our customers in INDIA & ABROAD. •	IXth ASIAN Games 1982, New Delhi. •	CommonWealth Games (CWG) 2010, New Delhi. •	National Games 1985, New Delhi. We are also supplying Sports equipment on regular basis to Sports authority of India. Department of Sports & Youth affairs in different States of India. Sports department of various State Govts. Sports Authority of INDIA etc. Our ethical business policies and transparent dealings have made us a trusted name in the market and our Endeavour is to exceed client satisfaction by offering quality and durable sports equipment keeping in mind safety & value for our clients. We have good knowledge of sports industry & are alert to the new developments taking place in the Sports industry. We vigorously follow ethical and transparent policies.